Sure Women and French Connection have joined forces in a fantastic fashion giveaway, offering Sure Women customers the chance to win a brand new French Connection outfit every day from June through to September – the idea being that you can ‘refresh’ your wardrobe and be kept fresh by Sure Women. I'll be taking part in the ‘refresh challenge’ which is basically me using the new Sure Women deodorant through my day where I'm constantly on the move and see how it holds up. I'll also be showing you the two outfits i picked from French Connection next week too, they're fabulous! This is such a fun giveaway and i think the ''refresh'' concept behind it is really unique. So if you want to be in with a chance of winning your favourite outfit all you have to do is pick up a promotional 250ml can of Sure Woman, browse through the outfits (it took me forever) and then enter your unique code for a chance to win. It's as simple as that! Good luck everyone! 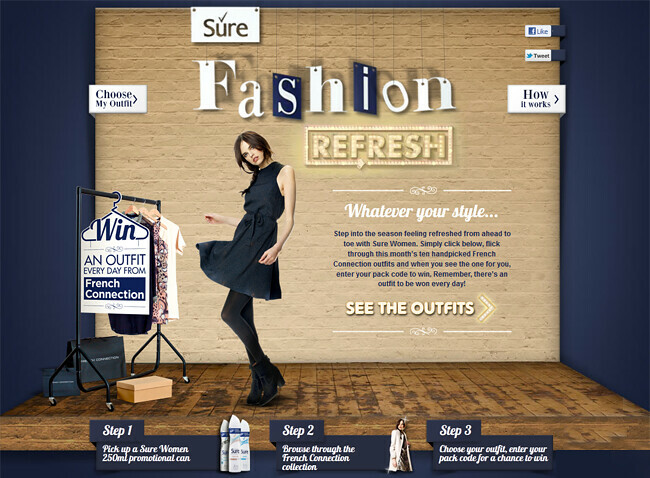 You can enter the Sure Fashion Refresh competition and win an outfit from French Connection here.